One of the best parts of blogging over the last seven years is watching the development of an entire industry that didn’t even exist when I started blogging. Back in 2011, nobody could refinance their student loans. You were stuck with what you took out in medical school until you got them paid off, which usually started at 6.8% for federal loans and was as high as 8-10% for private ones. This was a huge difference from when my class graduated in 2003 and every one refinanced at 0.9%. When combined with the rapidly rising cost of tuition, it was deadly. 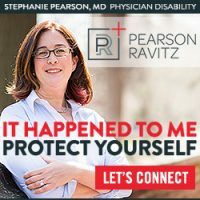 Thankfully, private companies stepped into the breach beginning in 2013 and have been serving young doctors and other high-income professionals ever since. In this post and for the New Year, I wanted to do a post that not only provided a broad overview of what was currently available in this sphere, but also give you the chance to compare and contrast the various companies. 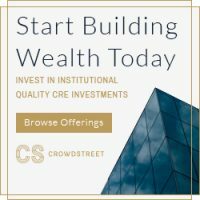 The companies listed in this post are all partners with The White Coat Investor and each of them offers a special deal to WCI readers if you go through the affiliate links on this page. They have all refinanced dozens or even hundreds of satisfied WCI readers. They have sponsored the scholarship, the Financial Bootcamp email course, the forum, the podcast, and other endeavors we have undertaken here trying to boost financial literacy among professionals. I’m grateful for their support. But I don’t expect you to refinance with them out of a sense of gratitude for what they’ve done. I expect you to refinance with them (if appropriate for you) because it’s a heck of a good deal, and it almost always is. What is new with student loan refinancing at your company in the last year that our readers should know about? What do you see as your company’s strengths over its competitors? Which of your competitors do you admire most and why? That last question was just for fun, but I thought the answers were interesting. Most dodged the question (often quite creatively and entertainingly) and others named multiple competitors. I’m going to include the provided answers to those questions and also a few brief comments on each company of my own. Special thanks to our assistant editor Jill for all of her work on this post. This year, Earnest has been on the move—both moving to a bigger office in downtown San Francisco as well as opening a second location in Salt Lake City as we grow. In October, we partnered with Navient as an independent subsidiary. Earnest is very different from any other student loan refinancing company. First, we allow borrowers to design their own loan based on the monthly payment that best works for them. For example, if your ideal monthly student loan payment is $600 or $850, we can design a loan around what you need. We know for new doctors this can be really helpful in the early days of figuring out personal finances. Most other lenders, simply drop you into a predetermined term of five, 10, or 15 years or more. We also stand out with our in-house servicing. Every Earnest loan is serviced for the life of the loan by our own team. 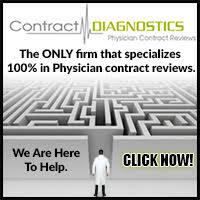 We have worked with thousands of new MDs and understand your specific concerns. As a company, we have always admired First Republic Bank because they have an incredible commitment to customer service—as does Earnest. Earnest wins the award for actually answering the questions they were sent. What stands out most about Earnest in my view is just how flexible their loan options are. You can pick the term, you can pick the payment, whatever you like. You want a 4 1/2 year loan? No problem. You even get a little lower rate than you’d pay with a 5 year. That flexibility can allow you to make your finances really efficient. Refinance with Earnest today and get $300 back! 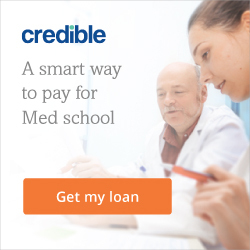 Student Loan Refinancing: We recently launched Student Loan Refinancing for Medical Residents, where eligible medical residents and fellows can keep their student loan interest from compounding over the course of residency (up to 54 months), and only make $100 monthly payments during residency or fellowship. In May we launched SoFi Wealth, the first low-cost online wealth management platform to combine an easy-to-use online and mobile interface with unlimited access to live, licensed financial advisors, giving people the guidance they need to understand, define, and then work toward achieving their investing goals. SoFi’s benefits go beyond our competitive rates, easy-to-use platform, and speedy turnaround times for funding – we also offer exclusive access to numerous membership benefits including career coaching, networking events, and complimentary financial advising. We think that student loan debt is a problem that needs solving, and we’re glad to see more and more attention being paid to this space. Ultimately, our product isn’t right for everyone, so we’re glad that we have competitors who can serve those in need. The thing I like most about SoFi is that YOU like SoFi. Over the years, more of you have refinanced with SoFi than with all of the other companies on this page. 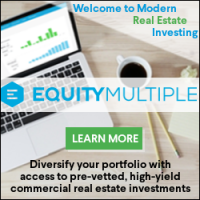 They are the big player in this space, a position they’ve earned through innovation, low rates, excellent service, and a commitment to promotion through partnerships like this one with The White Coat Investor. New for 2017? A true resident refinancing program. 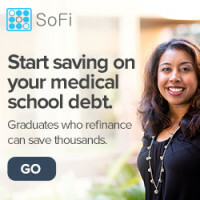 Refinance with SoFi and get $300 back to you! 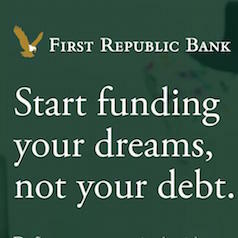 First Republic Bank offers clients the opportunity to refinance their student loan debt with fixed rates as low as 1.95% APR, which are among the lowest rates in the country. Each client also receives their own personal dedicated banker, ready to help with everything from day to day banking activities to guiding them through home ownership. We are glad there are options available for individuals to refinance their student loans that live outside of our core markets. More than any of the other companies on this page, First Republic seems to be looking for a long-term relationship with you. They want to do your checking, your savings, your mortgage etc. As a result, they offer very good rates on the student loan refinancing product. In fact, if you qualify, they are often the best. Unfortunately, due to their limited geographic reach, most WCI readers don’t qualify. But if you live in California, New York City, Boston, Greenwich CT, Portland OR, and Palm Beach FL, be sure to include them in your search. 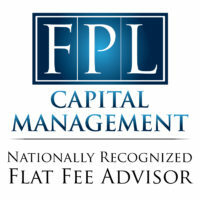 * For all loan terms and conditions, visit www.firstrepublic.com/student-loan-refinancing. Refinance with First Republic Bank by contacting my banker Kerry Berchtold at 339-235-0419 or [email protected] and let her know you were referred by WCI to get $200 back. 2017 has been a big year for CommonBond. As a company, we crossed the milestone of funding $1.5 billion in refinanced student loans, helping tens of thousands of members save money. We also introduced a unique refinancing benefit for doctors, whereby doctors can refinance their loans with a job offer that starts in the next year. 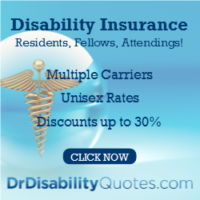 This means they can defer their balance for 12 months while they finish their residency or fellowship, but use their future income to get the best rate on their new loan. Since day one, our goal has been to set ourselves apart by designing a better student loan experience, combining advanced technology with competitive rates (doctors who refinance with CommonBond save over $50,000 on average) and award-winning customer service from our Care Team. But perhaps most importantly, we remain the first and only finance company with a “one-for-one” social mission: for every loan we fund, we also fund the education of a child in need. To date, we’ve donated more than half a million dollars to Pencils of Promise, and invite CommonBond members to join us each year on a trip to Ghana to see our Social Promise in action. We remain inspired by the federal government’s programs that support public service borrowers — and we strongly encourage doctors to see if they qualify for PSLF before looking into refinancing. CommonBond has been with WCI for years now and I have yet to get a complaint about customer service. Their social mission is pretty unique among their competitors. They also refinance Parent Plus loans. 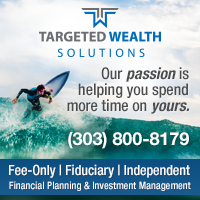 They have a particularly high refinancing limit- $500,000 that sets them apart from their competitors. They also have a unique “hybrid” loan, with a fixed rate for 5 years and then a variable rate. 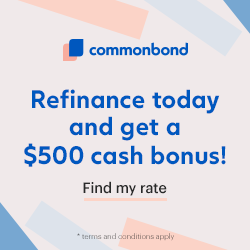 Refinance with CommonBond and get $500 back! LendKey was focused on improving the student loan refinancing process for our borrowers and working with our network of 275+ not-for-profit lenders to make available loan products even more competitive in 2017. To make the application process easier, LendKey released a major mobile update so applicants can check their rate offers in minutes on their mobile devices and automated the collection of some necessary documentation to reduce paperwork. Loan products also got an upgrade as more lenders joined our platform offering larger loan maximums (up to $300k for medical professionals) and longer term options (like 20yr repayment) to keep monthly obligations low for risk averse borrowers. 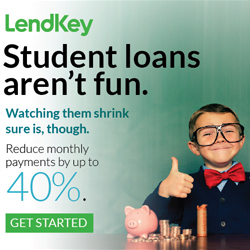 LendKey sits in a unique position in the student loan refinance market as a provider of access to hundreds of community lenders across the country. Borrowers get the best of both worlds at LendKey, including the ability to rate shop across various lenders in a few minutes, not having their information shared with any external party, and working directly with LendKey from application until final payment. 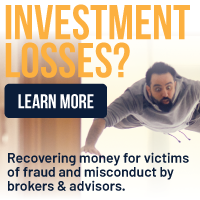 Not-for-profit lenders found on LendKey also offer unmatched benefits such as interest only repayment plans, cosigner release after 12 on-time monthly payments, lower cost of funds to offer the most competitive rates, the largest unemployment protection in the market at 18 months, and more. As a digital origination and loan comparison platform, LendKey doesn’t directly compete with any single lender, so we admire and respect each one’s attention to the issue of high-priced student loan debt and their commitment to making that debt more manageable. Lendkey is unique in this space in that they go out to hundreds of local credit unions and banks to try to get you the best possible deal. Their primary value is that they do the shopping around for you. While they have some similarities to Credible, there are even more available financial institutions, although most are very small. Refinance with LendKey and get $500 back! From working on new product development, to getting publicly listed on the Australian Stock Exchange, and tons of great milestones in between, we’ve had quite a busy year. We’ve launched a marketplace for credit cards and have added a number of new lenders to help deliver transparency, choice and savings to our users. Those additions include resident-specific refinancing as well as products with no cap on the amount eligible to be refinanced to better help medical professionals reduce the cost of their student loans. Going to any one lender limits your options to that specific lender’s product suite and underwriting criteria. With Credible, you can receive personalized, pre-qualified rates from up to 10 lenders in just 2 minutes. This is all accomplished without impacting your credit score and without sharing your data with any lender until you’ve picked the loan option that is right for you. We’re inspired by the fact that marketplaces are growing fast which creates more value to people with student loans; we believe a thriving category is good for all brands. The big deal with Credible is convenience. With a single application, you can apply with multiple companies and organizations and have them compete for your business, like Kayak or Orbitz. The downside? Many of the best lenders (including most of those on this page) aren’t on their platform. That’s no reason not to include them in your search, as they give you access to a bunch of the smaller lenders in one convenient package, but unfortunately they can’t function as the one-stop shop we would all like them to be for refinancing. Refinance with Credible and get $550 back! 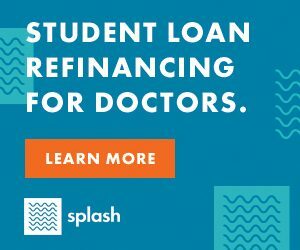 In July, Splash launched our refinance product for medical residents and fellows that not only offers a low fixed interest rate but also one of the most flexible repayment structures on the market – Up to 84 months of loan payment deferment for those in training. 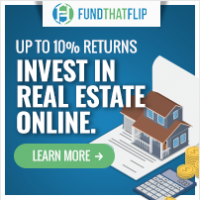 Splash also launched a promotion with the White Coat Investor to provide up to $1,000 cash back for those who refinance through the site. 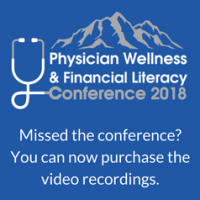 Not only do we cater only to medical professionals, but we are focused on educating and empowering educated financial decisions rather than making a profit on every client. For some clients refinancing may be the right choice, but for others that may be REPAYE or PAYE. Commonbond because they have been able to make social giving core to who they are and we have similar goals as a company. 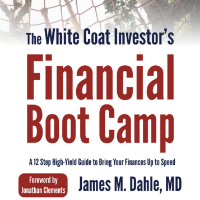 Splash wins the award this year for being most responsive to White Coat Investor readers. They were new to us in 2017 and when they first hit the market, they had an origination fee. WCI forum participants never hold back on their true opinions of something, and they were particularly harsh about that fee. To Splash!’s credit, that fee was rapidly removed. They are one of four companies offering a true resident/fellow program and have the lowest required payment ($1 a month) for that program. They also have, at least potentially, the highest cash back offer for WCI readers to refinance through them. Refinance with Splash Financial today and get $250-1000 back! At Education Loan Finance, our goal is to empower our borrowers to take control of their student loan debt through solid advice and relevant information that works. Our management team has over 30 years of experience in student lending and is backed by SouthEast Bank – not some online start-up company. We are also able to offer some of the lowest interest rates available in the industry. Education Loan Finance’s Personal Loan Advisors are individually dedicated to each of our borrowers every step of the way throughout the refinancing process. Our Personal Loan Advisors work diligently to find the right loan product for our borrowers and have direct lines of communication with our customers if any questions should arise. There is no need for our borrowers to have to explain their situation over-and-over again. We know our customers and pride ourselves on our individualized customer service. The competition should all be admired for offering hard working successful college graduates with student loan refinancing options that are “empowering a brighter future”. Southeast Bank wins the award for best dodge of almost ALL of the questions. 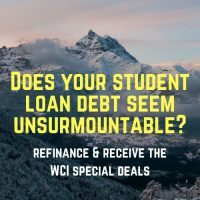 They are new to WCI readers in 2017, but offer all of the usual options: loan terms from 5-20 years, variable and fixed, competitive rates, lend in all 50 states, no pre-payment penalty, and excellent service (no complaints to me in 2017.) They do have a hardship deferment program, although it is at their discretion. They also have a very low minimum loan ($15,000). 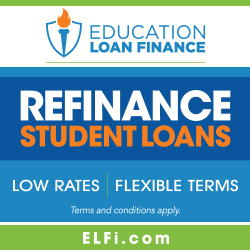 Refinance with ELFI today and get $325 cash back! In late 2017, LinkCapital lowered interest rates for both of our loan programs, resulting in interest rate reductions of up to 1.15% for some borrowers. In conjunction with the decrease in loan rates, Link also made improvements to our medical resident loan program structure so that the post-training interest rate reduction that we provide is now automatic. Our exclusive focus on medical professionals allows us to meet the unique needs of physicians, residents, fellows, and dentists alike. Link borrowers have often said that the level of hand-holding provided throughout the entire refi process is unparalleled and that our team, senior management included, was available to help if any questions arose. We very much respect Commonbond’s social promise. Link Capital is great in that they just do student loan refinancing; no hassle, no fuss. No fees or penalties or need to open a bank account. 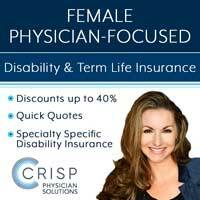 They also offer a resident program with automatic continuation if you go into a fellowship AND your co-signer (if any) is let off the hook in the event of your death or disability. Refinance with LinkCapital and get $600 cash back! In 2017 we evolved from DRB Student Loan to Laurel Road, a Division of Darien Rowayton Bank in order to align with our mission to help determined professionals achieve their goals with our tailored financial services and superior customer service. Laurel Road serves customers in all 50 states and to date, we’ve saved our borrowers a cumulative $400 million by funding over $3 billion in loans. On average, medical professionals save $28,000+ over the life of their loans with Laurel Road, with no application, origination, or prepayment fees. * Click here for more information. Our customers continue to benefit from our status as an FDIC-insured bank. 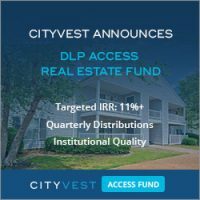 This designation provides Laurel Road with a low cost of capital and thus the ability to provide some of the lowest interest rates in the marketplace to our borrowers. 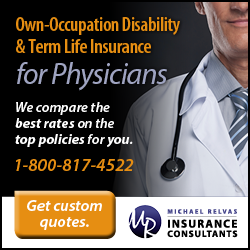 Further, as a leader in the industry, we understand and value healthcare professionals and therefore create unique repayment programs tailored to your unique financial situations. For example, our resident and fellow refinancing program remains best-in-class with a $100/month payment option during training. We admire all of our competitors’ desire to help young professionals reduce the cost of their student loan debt and ultimately benefit our nation’s healthcare system. Laurel Road deserves accolades primarily for their pioneering efforts in the student loan refinancing space. Not only were they the first after the Global Financial Crisis to offer this service to indebted professionals, but they also provided the first true resident product. While being the first to do something often means you have to work out the kinks, their new focus and Laurel Road rebranding has also come with an enhanced ability to provide top-notch customer service. You know when you refinance with Laurel Road that hundreds of WCI readers have paved the way for you over the last 5 years. 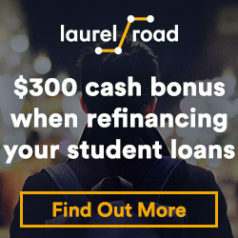 Refinance with Laurel Road and get $300 cash back! I hope that overview of the 2018 student loan refinancing landscape is useful to you. The most important thing for those who need to refinance their loans is to actually refinance your loans. If you’re not going for PSLF, and don’t need or don’t benefit from the federal income-driven repayment programs, then get off your duff and refinance. Then get serious about paying them off. As nice as these companies are, you don’t need them moving into your basement permanently any more than Sallie Mae. What do you think? Have you refinanced your loans? Who did you use and why? Would you like to see more in-depth reviews of each of these companies on the blog this year? Whose answers impressed you most? Comment below! My wife and I are both physicians. What is the best way for us to consolidate our loans? Together as one? Separately? Any one of these companies offer unique products for couples? Generally you keep them separate so if one of you dies, they go away. Sometimes there is an advantage to having a co-signer that may or may not be released in the event of your death or disaiblity. That’s not true at all. Do you know the name of the representative that told you that? Because I’m sure his or her boss would like to know about that. The only way your spouse can become responsible for your student loans is if they co-sign for them. But even if that were the case (again, it isn’t) then it would be cheaper to buy a little extra life insurance on you than to pay all that extra interest. A couple hundred thousand of 5 year term life is pennies. there is one exception. If the loan has a co-signer, SoFi retains the right to pursue them for the balance. Amy – I can speak to how LinkCapital handles this issue (full disclosure: that’s because I work at Link). We make this 100% clear in our loan documentation that the loan is discharged in the event of borrower death. That is true even if your spouse is the co-signer on the loan. Our loan agreement (the legal document that our borrowers sign) specifically states that borrower, and their estate, will not be liable for the debt in case of death or permanent disability. Just to be clear, the co-signer is not liable in the case of borrower death or disability, regardless of whether they are the spouse or not. So if a parent or anyone else is the co-signer, they will be off the hook as well. 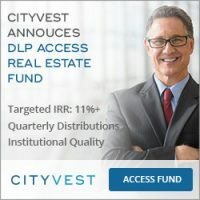 Is there a good site/forum post to compare real-world rates that people are actually getting on these loans (as opposed to their “as low as” rates? Sure you can go with the shotgun approach (and probably should). Just curious if folks are actually getting their lowest advertised rates. Yes, some are, but most are not getting the lowest possible rates. High debt to income ratio or bad credit are the usual causes. Plus, most people aren’t willing to do the 5 year variable thing. If your DTI and credit score are really good, you’ll probably get the lowest rates. My debt to income ratio is about 0.9. 190k debt and 210k income. Credit score of 770. I’m willing to do a 5 yr variable option; what interest rates have you heard of people like me getting? Thanks! I’d expect to be at the low end of the published ranges with those numbers. But I don’t have any more data than that. Just a note about the debt to income ratios that lenders use. I am with LinkCapital but this approach is consistent across lenders. The DTI ratio is the ratio of monthly debt payments to monthly income, so the total face or principal amount of debt does not matter. So if you pay $3,000 a month on your debt and make $10,000 a month, you have a DTI ratio of 30%. I’m helping my busy husband refinance his loans. He finished his fellowship in June and is happy now in private practice. We requested quotes from several companies listed here and picked CommonBond because their rate was the lowest for the loan we wanted. After going through the entire application process, we found that the rate had increased by more that 1% on the final documents. When I asked about it I was told that we needed proof of income for 12 months to get the lower rate. Since we only have 6 months of income we were bumped up to the higher rate. This was a surprise for me. Is this unique to CommonBond? Or do all companies require 12 months of income to qualify for a lower rate? They counted our 6 months of income as an entire year salary. This all happened today. I’m wondering if I need to adjust the yearly salary on all my quotes to get an accurate comparison of the various companies. I don’t want to go through the application process with another company and find myself disappointed again. That’s a very detailed question. I think before signing the final paperwork I’d go a little deeper in the process with other companies. That will answer your question as to whether you can get a lower rate somewhere else. It sounds like you kind of stopped prematurely with the other companies based on the initial quote. 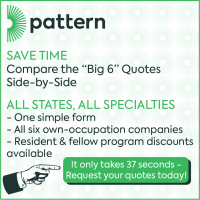 Since your final quote wasn’t the same as initial quote, you need to look back and see if the quotes you got from the other companies were better after the 1% increase. I’m curious as to why such a large increase. You said “they counted” your 6 months of salary as a year’s salary. It sounds to me like in the end it didn’t. Did someone tell you it would? When I put in our yearly salary for all of the quotes, I listed his current salary. I’m wondering if I should have put his salary over the past year which is a combo of fellowship and attending. All of the other 5 companies that I got quotes from were lower than the 1% increase but I’m wondering if those quotes are wrong because I put in the salary wrong. Obviously our debt to income ratio is different depending on what the loan company counts as income. With CommonBond I had listed on the application the yearly salary as his attending salary now. When I submitted the paystubs and number of months in the practice, they adjusted the rate to match the amount that he made for the last 6 months and counted it as a full year salary. They didn’t double it to show his expected income for a year. I can submit the fellow salary from the previous 6 months but I’m not sure that the rate will go up much. I was under the impression that once you are in an attending position you can claim your income as your new salary. I thought we were behind the game refinancing 6 months out of training instead of right away. What I am hoping is that other companies do not require a year at the attending salary to claim it as income. Do other people refinance right out of training and claim their new attending salary and get a rate to match it? Great question. The good news is once you’ve gathered the paperwork to apply to one, applying to a couple more is pretty easy. Every company treats this issue differently, so I think you’ll be better off with someone besides CommonBond, but I’m sorry that I don’t have this information in one easy table so I could tell you exactly who to go with. It would require an email/call to each company specifically asking this question to compile the information. If you are interested in doing that, we could certainly write it up and get that information out. Just an update, Link Capital, SoFi, ELFI, and Laurel Road do not require a full year of attending income. I haven’t heard back yet from Earnest. Dianna – Speaking for LinkCapital you are correct. As long as someone has either an employment contract or regular pay stubs, we don’t need a history of pay if someone just started a job. However, it does get tricky if someone goes right into private practice and there is no history as it gets really hard to verify income in that case. Luckily we do not see that too often. I heard back from Earnest, they do not require a full year on income. Cool! Funny how they all have slightly different rules. Shows the importance of applying to several. I’m at the tail end (23 years since graduating medical school) of paying off my loans. Interest rate is 7.75%. Still owe a lot due to some life/finance setbacks along the way, but been more stable for past 14 years. At this point, all other debts paid off (including mortgage). Saving for retirement. Have the money to just pay it off, but that would consume too large a portion of my savings for my comfort. I am on self-made program of paying extra per month, about $1,750 extra on top of required payment). I can do this for four more years and be paid off. Not enough time left to benefit from the PSLF program. Did the numbers with the re-fi option lower rates and they all get me paid off a few months early, only a few months and I lose the forbearance option that Feds have if there is a disaster or emergency. Having actually had that happen to me earlier in the career track, I know how important that option is. So, I decided not to re-fi. Were I about 20 years earlier in this process, I’d probably re-fi. You’re making me cry. 23 years at 7.75%? Ouch. Even 14 years is forever. Why are you more comfortable with money in the bank earning 1% and paying 7.75% in interest than paying no interest and not earning 1%? Looking at money that way has prevented you from building wealth for the last two decades. It’s not working. Stop doing it. I think you will feel a huge burden come off your shoulders if you pay off your loans with everything you can liquidate without significant tax consequences tomorrow. That’s what I would do. Maybe keep a few thousand in cash, but that’s it. Then all that money you’re using to make payments (especially at 7.75%) can rebuild your savings very quickly. I guess I’ve learned three big lessons from my financial experience. 1. I’ve always considered myself to be financially responsible but it is so easy to get way behind the eight ball with debts and not really be able to keep up paying them off the way one planned to do so when the debts were established. Never had any credit card debt, ever. Cars in the past always paid off early (now we buy with cash). But as WCI says, it is the big rocks that sink you. Was going along paying extra on the mortgage to pay it off early, etc, and then took out a HELOC to pay for a major renovation of the back yard to deal with a big drainage problem. Never used the HELOC for any toys or consumables or stuff like that, but wound up adding on a bunch of stuff for the house over the years (carpeting to replace carpets that were so old they were shredding, electrical work to fix old, worn out wiring and safety stuff, painting the outside of the house, etc) Was paying $1,000 a month for the HELOC and never got better than 2 years away from paying it off. That $1,000 a month was supposed to go for the extra payments to the mortgage. I’m so good at avoiding credit card and auto loan debt, and yet that HELOC and a cash-out mortgage re-fi 10 years ago really became a debt trap. 2. Now, after an inheritance last year that allowed us to pay off the mortgage, pay off the HELOC, and fully ($24,000; I’m over 50) fund my 403b I can say that it is a lot easier to save money when one has money. I know that Jim does not understand my choosing to have money in the bank for now instead of paying off the loans. We will be investing it in mix of index funds and some safe storage like CD’s and bonds once we know how much is left over after the 2017 taxes are paid. There may be a chunk I can use to make a large principal payment to the student loans but spouse and I both have had some life experiences that have taught us to want to hang onto cash for emergencies, but the basic point is that it is much easier to save money when one has money. 3. 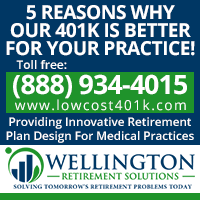 Even with both myself and my spouse having made monumentally dumb financial moves in our lives before we were together, we will still be OK for my spouse to retire from high-school teaching at age 62 and me from pediatric specialty at about 64 or 65. I am OK with that. Retiring earlier would be OK, too, sure. But I’m OK with going to 65 if I have to. At one point earlier in my career, it looked like I’d have to plan to die in office, so now I have realistic plans that should not be difficult to stay on track with and get out by 65. But the lesson I have learned with this is that when one is coming out of residency one thinks they can do this stuff forever. I was a resident and then a fellow before the work hours rules started. Working long hours was no big deal for us. I could not even conceive of the idea that I might want to plan for the end of my career (i.e., retirement) at that early stage of my career. I could not understand really what it meant to get worn out and want to retire. My grandparents were retired before I was really old enough to know the difference between them working and them being retired. My father did not retire until he was 71 and that was just about 7 years ago, so I just did not ever think in terms of wanting to retire someday and that the someday might be before I was truly old. But now I’m in my early 50’s and the grind of working all the time wears on me. Being on-call 24 hours a day for 7 days in a row (we don’t have fellows) wears me down, more than I ever thought it could. Now, yeah, NOW!, I can understand this whole retirement thing! Now I can conceive of it and how darn important it is. And, how darn important it would have been to pay some of my loans back during residency and fellowship and how important it would have been to be more careful about paying off debts sooner. I’m an intern right now and not planning to do PSLF. Since I don’t have a large attending income and I have a large income to debt ratio ($50k earning; loans $270k), what companies are suggested? Anyone have a similar experience? Sofi is giving me around 5% with their resident program which doesn’t make sense since I’m getting 6.1% with REPAYE right now. In March however, I’ll be giving 10% of my income towards that loan and thereby reducing my effective interest rate to the 4-5% mark anyway. You only have four choices. Be sure you calculate your effective REPAYE rate after the subsidy to compare. Your couple of sentences are confusing to me. If you’re getting a lower rate with SoFi than your effective rate under REPAYE and you’re not going for PSLF, why not refinance? I don’t understand why making bigger payments reduces your REPAYE interest rate either. Right now I’m paying 6.1% interest on my loans with REPAYE, effective being close to 3.75% since my prior year income is $0 so I get the max REPAYE subsidy. Starting March, my resident income will be considered and I will not get as high a interest subsidy from REPAYE making my effective rate close to Sofi’s current rate they are offering me. If it is close, I’d probably stick with REPAYE in case you change your mind about PSLF. But if you’re very sure you won’t be doing PSLF and the SoFI rate is significantly less than your effective REPAYE rate, sure, why not? I liked how ELFI was described as “best at dodging questions.” When I refinanced with them (before the WCI deal) I was promised a rebate. Every time I contacted them I had to send 3-4 emails before I got a response. And then they wanted a w9 filled out to send the rebate out (i.e., make the rebate taxable income, which is not common place at all). I will not be refinancing with them in the future. Interesting. I hadn’t heard of anyone issuing 1099s for the bonuses. I had always thought about that money as a discount on the loan. Anyone else received a 1099 after refinancing? A note on Sofi: I had a bunch of trouble getting them to refinance my loan due to my actual take home salary being different (much larger) than my “base salary”. The way my contract is structured, which is apparently common on the east coast at academic places, is that I have a low base salary and a large “clinical supplement”. This is basically a way for my institution to protect itself from a big disability or life insurance claim, which are all based off the base salary. Proving to Sofi that this clinical supplement was not a bonus, and was part of my standard compensation took a lot of emails, discussions on the phone, a copy of my contract, a letter from the finance office, and even an exchange with the now ousted CEO! Keep in mind, I have no idea if I would have had the same issue with another company but it was highly annoying. I eventually got it sorted, and was very happy with the interest rate. Hopefully they work the snags out with this, as I know many people have similarly structured contracts. 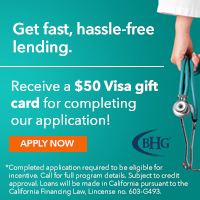 Is there any company in particular that you have had experience with that would be willing to offer a loan to a physician with a credit score in the 690s? Good credit history over the past 2 years, but a couple missed payments in years prior. Thanks! I don’t know. Your interest rate would certainly be higher. But you could just refinance again a year later. It doesn’t take that long to recover from a couple of missed payments. My credit score is around there; just refinanced my massive 7.25% federal loan with Sofi for 4.625% fixed for 7 years. SoFi as of Jan 2018 says they won’t refinance a resident in the last year of training. I was asked to apply twice, and spent a lot of time on the phone with different people to find this out since Nov of 2017. I am in my last 7 months with a signed contract, they said to re-apply when I’m actually working, they won’t do the $100 a month thing because it’s “too close” (This is not what their website says) which over 7 months of $900/month to the gov adds up to what I consider wasted payments. Interesting that you were in a gap between the resident product and the attending product. Send me an email and let me see if I can get you some help. As I recall, SoFi certainly does (or at least until recently did) refi residents with an attending contract in hand at attending rates. If they won’t do it, there certainly are others who will. 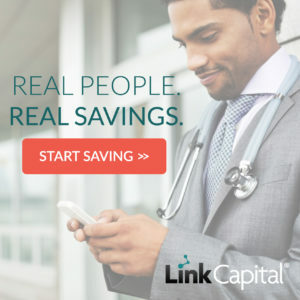 At LinkCapital, we have two options for a resident in their final year of training: either the regular resident program, or if you have an employment contract that starts within the next 12 months, you would get our full attending rates (but still don’t start making full payments until after training is completed). I am currently an intern at a psychiatry residency program in the midwest. I recently refinanced one of my loans with Laurel Road. I have federal loans (~170K) that I have consolidated with fedloans at a 5.8% interest rate and a private school loan (120K) initially at 4% that I refinanced. The school loan was not one that I wanted to refinance given the relatively low interest rate but my school refused to lower my monthly payments. In fact, they wanted me to pay 1,400 per month, which was honestly just ridiculous. They also refused to let me defer. At that point, I was running out of options and had no idea what to do until I stumbled upon wci. I was behind in payments by 2 months and was very worried that my credit would be affected (it actually dropped from 720 to 688). I found laurel road through this website and went through the process which took about 1 month overall. I opted to go with a 7 year fixed at 5.08% but will refinance later with a 5 year variable. I plan on working in a rural area after residency and moonlighting, which is quite lucrative for psychiatrists and hopefully make enough to pay off my loans in a few years. I will also refinance all of my loans and hope to get rid of them as soon as I can. Again, I want to thank wci for the wealth of information you have available! Get through residency, then take advantage of the huge arbitrage available by living like a resident and earning like an attending to put yourself on a sound financial footing for the rest of your life. Glad I was able to help with the loans. You only need to post your question once. I see all the comments posted on the entire site. Yes, with a co-signer, they’ll let you refinance. 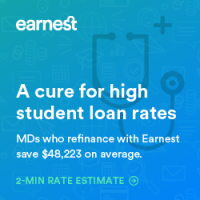 I attempted to refi my student loans with Earnest who had the best rates, but was denied because they’ require 2years?! of proof of earnings for a “self employed” income. I’m a recent grad and have been working as an attending x4 months paid via 1099. I find it odd that I have to wait two years to apply for student loan refinance. Perhaps I incorrectly classified my income in the prequal application, but the gentleman I spoke over the phone with wasn’t able to remedy. Has anyone else ran into a similar issue with proof of income requirements for 1099ers? Sounds like a good reason to move on to the next company. Yes, they all have underwriting requirements and they’re all different. One of them will refinance you I suspect. If the rate isn’t great, do it again in 20 more months if you still have loans left. The next company unfortunately does not have nearly as good of a rate, and given the fact that the fed has raised interest rates recently, the rate I am getting from all these refinance companies is not markedly better than the government loans original rates. Anyway similar issue just occurred to me when looking into mortgages, I just got off the phone with the bank – the 1099 income makes me look self employed and they all want demonstrated 18-24 months of income that way. Ouch! I never realized that was going to be an issue for private contractors, I would assume lenders would jump at the opportunity to lend to physicians, to me it seems like a loss of business to them. Also thanks for all you’re doing with your blog, it’s a great service you’re providing to all of us. I am looking to refinance my loans. I currently owe ~$400k at 7% all from med school. I am 3 years out of training and recently transitioned from working for a 501C3 organization (and was planning to participate in PSLF) to a for profit group. I plan to stay with my current employer and would like to refinance my loans ASAP. I am ALSO looking to apply for a mortgage to buy a house. My credit score is 790 and I am looking to keep it as high as possible to get the best rates for refinancing and the mortgage. Which process should I go through first? Would it hurt my credit score to refinance my loans prior to applying for a mortgage? Thank you so much! Yes, it would drop your score, but at 790, maybe not enough to matter. The purpose of investing is to maximize returns, not minimize boredom. Boring is perfectly fine. Boring is good.